Castleford Tigers forward Grant Millington does not expect to miss the start of the new Betfred Super League season despite picking up an injury in Sunday’s 26-24 trial at Leeds Rhinos. The prop forward confirmed he “popped a rib” early in the game, but said the injury was unlikely to keep him out of action when Castleford start their season proper against Catalans Dragons at the Mend-A-Hose Jungle on Friday, February 1. 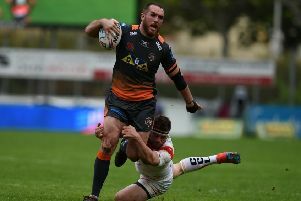 Millington said that he and his teammates would benefit from the run-out at Headingley, with most of the players taking part in their first game since last October’s semi-final defeat at Wigan Warriors. He said: “It was good. “For a lot of our squad it was the first hit-out we’ve had so it was good to get out there and really be tested. “It was really quick in that first 10-15 minutes and I think it was what we needed to roll into the start of the season. “We were good. We felt really solid defensively which we’ve worked a lot on. “It is good to see all the work we’ve done come through in that first half, but we want to be able to do that for 80 minutes. After leading 18-4 at one stage Castleford were forced onto the defensive for much of the second half with Millington admitting they failed to kick on from the great work of the opening half. “Leeds are a good side. They have the ability to do that, but at the same time I think we have to control the game a bit better. “We made a few errors on top of errors and against a side like Leeds, who have the ability to play fast and at you, you can’t give them that opportunity.